February 2013: coreIPM announces the availability of its SODIMM format AM335x based Linux board. 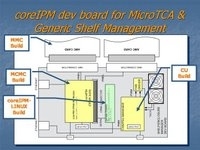 May 2012: coreIPM announces the availability of its new MicroTCA AMC development board. 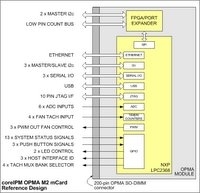 August 2011: coreIPM announces microTCA Carrier Management Controller (MCMC) and Power Module (PM) development board. January 2011: coreIPM delivers SGPIO backplane with full management support under Windows Server and Red Hat Enterprise Linux for SATA/SAS applications for a major client. December 2010: coreIPM now supports IBM BladeServer BMC applications. October 2009: Our remote management board RM23 is now in production and ready for delivery ! September 2009: Our LPC2368 based SODIMM form factor OPMA2368 boards are ready to ship! August 2009: Our remote management RM23 board is now production ready ! This is a beauty jam packed with everything you need for remote management and tracking. It's got an LPC2368 ARM processor and runs coreIPM software. Includes a tri band GSM/GPRS (900-1800-1900) modem. 20 channel SiRFstarIII GPS. CAN bus, runs off +6....32 VDC and much more ! We'll be shipping the first batch in September. July 2009: We now have an AMC dev board for sale. Check out our boards page. June 2009: We've completed the layout design for our LPC2368 based OPMA2368 board and our System Development board. Click here for our presentation. October 28, 2008 coreIPM announces initial release of coreIPM-LINUX, a fully fledged Linux distribution for Texas Instruments OMAP 35xx Cortex A8 devices with built in support for coreIPM management architecture. October 21-23, 2008 come and visit us at the ATCA Summit. We'll be at Stand 502. October 22, 2008 coreIPM now running on the Cypress Semiconductor nvPSoC processor family. October 7, 2008 coreIPM MicroTCA shelf manager goes alpha. May 22, 2008coreIPM - AMC Management Controller goes beta. Come and see our presentation "Building H/W Platform Management" at the Mountain View Alliance Communications Ecosystem Conference. Wednesday, 12th March 2008/4:00 pm/Software Track. October 2007 We're presenting "Open Source Tools for AdvancedTCA Platform Management" at the AdvancedTCA Summit. Santa Clara Convention Center October 16 - 18, 2007. Here's the presentation if you couldn't make it. If you are developing chassis or board management controllers in house, you are wasting your resources. Why reinvent the wheel ? Put coreIPM solutions and expertise to use for your platform management needs. We provide turnkey solutions so you can concentrate on your core business. coreIPM® is an open source management architecture for platform management. It is designed to manage systems that can range from an individual board to more complex configurations that can be made up of any combination of boards, blades, enclosure controllers, and multiple enclosure aggregations. coreIPM is compliant with the Intelligent Platform Interface Management (IPMI) v2.0 with PICMG 3.0 R2.0 AdvancedTCA extensions. coreIPM provides monitoring, control and inventory tracking functions. It can monitor sensors such as those for temperature, voltage, fan operation, power supply, security, hardware errors and provide logging and alerts. Control functions enable power control and resets. Inventory tracking makes field replaceable unit data available for management. coreIPM architecture is comprised of the coreBMC (Baseboard Management Controller) and coreSMC (Shelf Management Controller) hardware & software modules. coreBMC is fully sufficient by itself to provide board management functions. Coupled with coreSMC it’s possible to build shelves and higher hardware hierarchies such as an ATCA chassis. coreBMC is currently supported on ARM based microcontrollers. Work in progress to support other microcontroller families. coreBMC is independent of a main motherboard processor (the payload or host) and its peripherals, BIOS, OS, payload power and system management software that runs on the payload processor. It provides in-band access to management functions at all times. coreBMC can be built into a motherboard, a blade carrier, a shelf manager or packaged in an OPMA module. The coreSMC is UNIX/LINUX based and is compliant with the shelf management requirements of the AdvancedTCA specification. coreBMC provides the front-end hardware interfaces to the SMC in a shelf management configuration. coreBMC is the basic building block which integrates all system management fuctions into an off the shelf single chip microcontroller. Single chip solution saves board space and improves reliability. Mix/match microcontrollers Initial support for the NXP 32-bit LPC2000 microcontroller family based on ARM7 core. Work in progress to support microcontroller families from other vendors. Use the controller best suited for the task. Currently 32+ microcontroller devices to choose from. These controllers are designed for use in a range of applications requiring high performance and low power consumption in a cost-effective package. Wide range of peripherals including multiple serial interfaces, 10-bit ADC and external bus options. Supported peripherals and features • i2c • timers • general purpose IO pins • RS232 • SPI • A/D • PWM fan control • Watchdog Timer and Real-Time Clock with battery backup • Ethernet with lwIP TCP/IP stack • USB 2.0 • edge or level sensitive external interrupt pins • In-System Programming/In-Application Programming (ISP/IAP). Development Full set of development tools using either gcc or commercial compilers and debuggers from multiple vendors. JTAG interface enables FLASH downloads and on-chip debugging. EmbeddedICE RT and Embedded Trace interfaces offering real-time debugging. Full customization and porting services available. Licensing Dual licensing model. Both GPL and commercial licensing is available. The Open Source GNU General Public License (GPLv2) makes the source code freely available and distributeable to unlimited levels of sublicensees, but requires re-licensing in source code format, on identical terms, including changes and additions. Commercial licensees get a commercially supported product without a requirement that their coreIPM-based software be Open Sourced. The two licensing models cover identical products. To download the source code, contact the developers and other information please visit the project web site http://code.google.com/p/coreipm/. Message Bridging Routing between System Interface, Serial Interface, IPMB and LAN. Diagnostics ipmi_test: Linux based test program for exercising IPMI features, can be used as a basis for building a shelf manager. Also used for firmware updates. IPMI 2.0 and PICMG 3.0 Support IPMI 2.0 & PICMG 3.0 Release 2.0 compliant. All mandatory commands implemented. Easy to add additional command support. ATCA state management. Other capabilities • USB disk emulation for booting the payload off the management LAN. coreIPM BladeServer BMC development board. coreIPM-LINUX is a fully fledged Linux distribution for OMAP 35xx architecture with built in support for coreIPM management architecture. coreIPM-LINUXprovides a ready to use, extremely compact drop in solution for platform management. It is specifically targeted towards shelf and appliance management. • SNMP Trap generation, SNMP server & MIB for platform management. • OpenHPI server with coreIPM OpenHPI plug-in. HPI provides a standard and hardware independent service to upper level management software to set and retrieve configuration or operational data about the hardware components, and to control the operation of those components. The distribution includes the following components in pre-built and source form: • x-loader • u-boot • LINUX kernel • BusyBox • CodeSourcery GNU ARM tools • flash utilities • coreIPM components.